The Met Office says its short-term forecasts are "extremely accurate"
The Met Office is to stop publishing seasonal forecasts, after it came in for criticism for failing to predict extreme weather. It was berated for not foreseeing that the UK would suffer this cold winter or the last three wet summers in its seasonal forecasts. The forecasts, four times a year, will be replaced by monthly predictions. The Met Office said it decided to change its forecasting approach after carrying out customer research. Explaining its decision, the Met Office released a statement which said: "By their nature, forecasts become less accurate the further out we look. "Although we can identify general patterns of weather, the science does not exist to allow an exact forecast beyond five days, or to absolutely promise a certain type of weather. "As a result, 'seasonal forecasts' cannot be as precise as our short-term forecasts." It said the UK is one of the hardest places to provide forecasts for due to its "size and location", making it "very hard to forecast much beyond a week". However, it said its short-term forecasts are "extremely accurate". 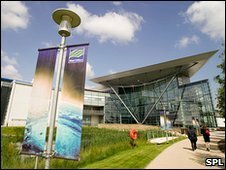 The Met Office, based at Exeter in Devon, added that it would work towards developing the science of long range forecasting. Will the UK get a sizzling summer?